Let's face it - Malaysian seafood lovers are just crazy over crabs. But where to go to satisfy that crab cravings without burning a hole in your pocket? Hotel Equatorial KL-lah! For a mere RM35++ per person you can have your fill of local mud crabs, Sri Lankan crabs, Australian king crabs or Dungeness crabs at the hotel's Nipah CoffeeShop. For RM45++, you can dig in at the Golden Phoenix restaurant. Now I bet any seafood lover worth his salt can tell that these are unbeatable deals as under ordinary circumstances, one would probably end up with just a kilo of crabs at any reputable reataurants within the Klang Valley. 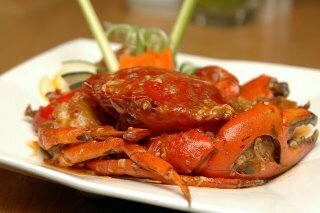 From now until June 15, 2006, the enticing Crabs Galore promotion at Nipah CoffeeShop offers irresistible appetizers, starters and main dishes using crabmeat, crabstick and live crabs. If you wish to have the whole hog, it's RM75++ per person for the entire buffet. Start off with light palate teasers such as Crab Tartar and Carrot Mousse, Crab Samosa, Spicy Crab Cakes with Red Curry Paste, Warm Crab Cakes with Spicy Remoulade Sauce and Crabstick Salad with Melon. Then get the chefs to cook soft shell crabs, King Crabs, mud crabs and even imported Dungeness crabs according to your liking and choice of sauces at the live cooking station . Our top picks include Sweet and Sour Sri Lankan crabs with a fabulously piquant sauce that emphasizes the natural sweetness of the cooked crabs. 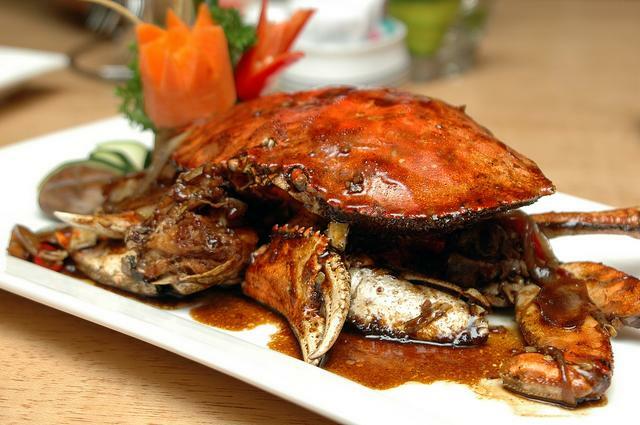 Another favourite that hits the spot was the Stir-fried Mud Crabs with Black Pepper Sauce – the full-bodied, peppery hot sauce went a long way in perking up the fresh, meaty crabmeat extracted from their shells. We found the soft shell crabs made for easy eating but choose the accompanying sauce carefully as their delicate taste can be easily drowned out by more robust sauces. Over at the Golden Phoenix Chinese restaurant, Chef Lai Ah Ngan's saucy concoctions include Thai Milk Sauce, Black Bean, Butter Sauce, Thai Chilli, Assam Sauce, X.O. 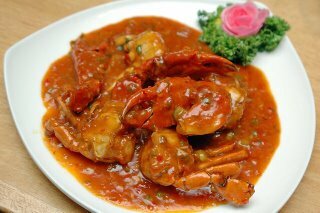 Sauce, Chilli Garlic, Dried Prawn ‘Sambal’ or even Salt-Baked. Enjoy unlimited servings of these scrumptious crabs for dinner from May 8 to 21. 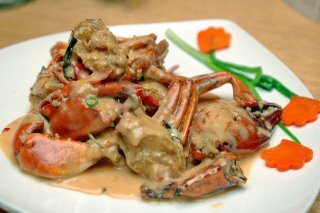 Thanks to the fleshy Australian Mud Crabs, the crustaceans tasted heavenly in the creamy and spicy Thai Milk Sauce. Redolent with curry leaves and aromatic Thai spices, the light yet flavourful sauce was so scrumptious we mopped it up with steamed flower rolls and crusty slices of French baguette. My favourite dish out of the whole lot was local Mud Crabs in Butter Sauce. We had a field day munching on the fine, crispy deep-fried strands of egg, deliciously enhanced with fragrant curry leaves. The Black Bean Sauce was a little more unusual and distinctively Oriental but great nonetheless. Personally I found the ones fried with Sambal Dried Shrimps overly salty but those who prefer spicier, bolder taste will have no complaints.